For years, Rogue Amoeba’s Fission has been my go-to tool for manipulating audio files. Whenever I need to trim songs, splice tracks, edit voice recordings, fade tracks in or out, or create ringtones, Fission has been simple and efficient—once you’ve mastered the basics, you can do any of these tasks and more. A big update, Fission 2, has been a long time coming, but it was worth the wait. In addition to an attractive new interface—with two themes, one dark and one light—it now supports FLAC files, and can convert files, alone or in batches, to and from any of the formats it supports: AAC, MP3, AIFF, WAV, FLAC, and Apple Lossless. Though it’s still not as versatile as the free XLD—which can convert multiple files at the same time, taking advantage of all available CPU capacity of your Mac—Fission’s file-conversion features will be sufficient for most users. 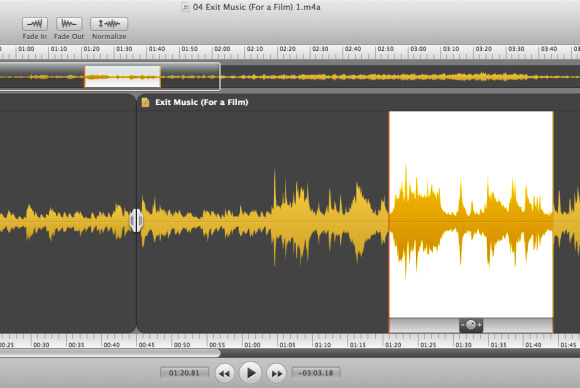 As with the original version, when you work with audio files in Fission 2, they’re edited in their original format; some audio-editing apps first convert files to, say, AIFF, and then later convert them back to their original format. Fission’s approach saves time and makes editing easier, as you can edit AAC or MP3 files without having to go back and forth to another format. While the essentials of Fission haven’t changed, the program’s new interface makes the program feel different, and overall performance seems snappier. The help system is much improved, as well, with more screenshots and illustrations to explain the tasks you’re most likely to perform. The new version of Fission also lets you open multiple windows—in the past, you could have only one window open at a time, and it was a bit of a hassle when you wanted to copy and paste audio from one file to another. Fission 2 also now supports enhanced (chapterized) AAC files, so if you create podcasts, Fission will simplify some of your work. Fission 2 can also upload audio to SoundCloud. Not all of Fission’s features are entirely intuitive. Notable for me is working with “split points,” which mark locations where you’ve split or pasted audio. For example, if you forget to remove split points, Fission saves your audio in multiple files. In terms of features, one thing that would be useful is the capability to have two windows display their contents at exactly the same scale—for example, so 10 seconds of content is the same size in one window as in another window. (Rogue Amoeba told me that the company will consider adding this feature in a future version.) A minor annoyance is that when you edit a file that contains album art (for example, that you’ve added using iTunes), the edited file shows a Fission icon, rather than the album art, in the Finder. The developer says this bug will be fixed soon. If you’re an audio pro—I’m admittedly not—you’ve certainly got programs that do much more than Fission. But for the rest of us, Fission is likely the only app you need to work with audio files, and it does the job easily and quickly.